As a concentrated source of blood plasma and autologous conditioned plasma, PRP contains several different growth factors and other cytokines that can stimulate healing of soft tissue and joints. Main indication in sports medicine and orthopedics are acute muscle strains, tendinopathy and muscle-fascial injuries and osteoarthritis. Main indications in dermatology for PRP are androgenic alopecia, wound healing, and skin rejuvenation. 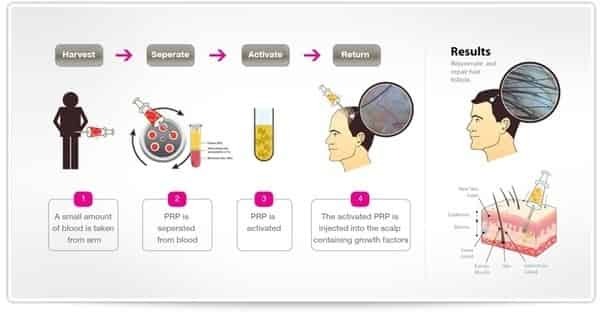 For preparation of PRP, various protocols are used, with an underlying principle of concentrating platelets to 3–5 times physiological levels, then injecting this concentrate in the tissue where healing is desired. .
A significant reduction in hair loss was observed between first and fourth injection. Hair count increased from average number of 71 hair follicular units to 93 hair follicular units. Therefore, average mean gain is 22.09 follicular units per cm2. After the fourth session, the pull test was negative in 9 patients. Laser Hair Therapy (LHT) has become the “first defense” treatment option for thinning hair. Hair restoration physicians and clinicians from around the world have adopted LHT as an integral part of medical hair management.